Sweet and rosy cheeked, with ample bust and twinkling eyes, she beckons to you, giggles, waves and winks. Such is the fun-loving, cute demeanour of a vintage Gil Elvgren pin-up girl. Beginning his career in post-war and post-depression America, the artist and illustrator Gil Elvgren created a world of girl-next-door pin-ups that define an all-American 1950s spirit: a carefree attitude mixed with raunchy consumer culture. TASCHEN delivers the ultimate compendium to Elvgren’s work, collating popular and rare prints and magazine work into book titles, as well as a publication that offers a taste of his work in its original vintage poster format. As the US regained its sense of optimism following the great depression, Gil Elvgren produced image after image of bodacious everyday women, benevolent and cheeky, naughty but mostly nice. Elvgren’s pin-ups were ‘real women’ albeit with slightly exaggerated features and their popular appeal lay in their normality and cheery affirmation of the American way. With Betty Paige hairstyles and skimpy dresses, their garters and short hemlines formed a ‘cheesecake’ layer of titillation while maintaining enough respectability to become widely dispersed and admired by many. Elvgren’s process involved photographing models in elaborate costumes at his studio and then translating the photographs into painted hyper-real portraits. Dressed in vintage clothing, Gil’s girls posed for calendars, story illustrations, and advertisements for products like Coca-Cola, Brown & Bigelow, and General Electric. Donna Reed, Barbara Hale, Arlene Dahl, and Kim Novak are just some of the models Elvgren painted who went on to become stars in their own right. 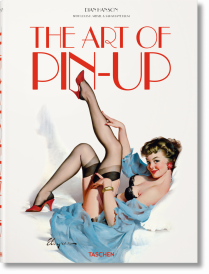 Alongside Alberto Vargas and George Petty, Gil Elvgren’s work has surged in popularity recently as nostalgia for pin-up girl art has grown, aptly demonstrated by the presence of TASCHEN’s anthology: The Art of Pin-Up. Truly surpassing his original context of commercial advertising and ‘pretty girl’ calendars, the work of Gil Elvgren has been elevated to its rightful status as art.